If you deleted your Graph, Table, or Game component by mistake, you probably accidentally clicked on the little red circle in the upper left of that component's window. To get the component back, just click on the Graph, Table, or Game icon in the Data Games menu at the top of your Data Games screen, as shown in the picture below, and a new component of that type will appear. 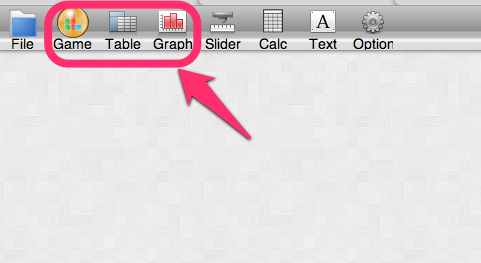 If you clicked on the Graph or Table icon, then the data you previously generated should appear in the new component window. If you clicked on the Game icon, then you'll need to start playing a new game.